Everyone knows that learning concepts of medical science and especially of MBBS course, is always a tough task. But sqadia.com provides medical students a forum where they can find almost all the content related to medical course or medical syllabus. Orthopaedic surgeon, Dr. Hammad Haider, accurately demonstrates the medical lecture ''brachial plexus injuries''. 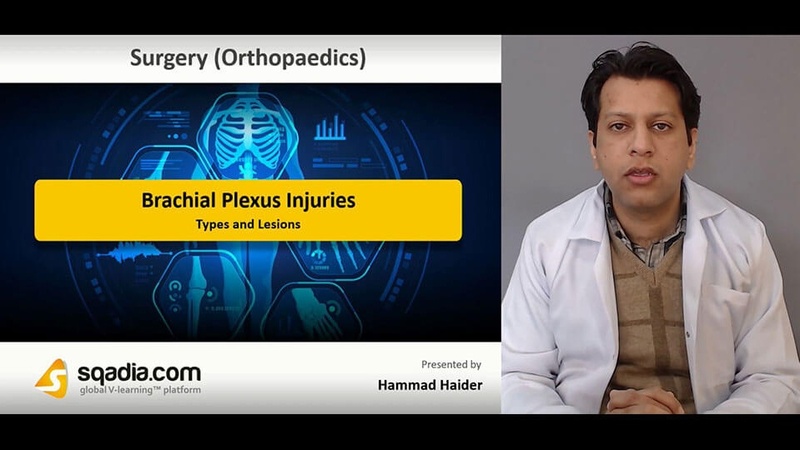 In this lecture, lesions of brachial plexus injuries, obstetrical brachial plexus palsy, nerves impairment, and forelimb nerve injuries are pursued. The medical lecture brachial plexus injuries firstly focus on types and lesions of brachial plexus. The brachial plexus is formed by the conﬂuence of nerve roots from C5 to T1. When the plexus is explored in its infraclavicular portion, the lateral cord is observed to lie anterior to the artery, with the medial cord lying posterior to it. 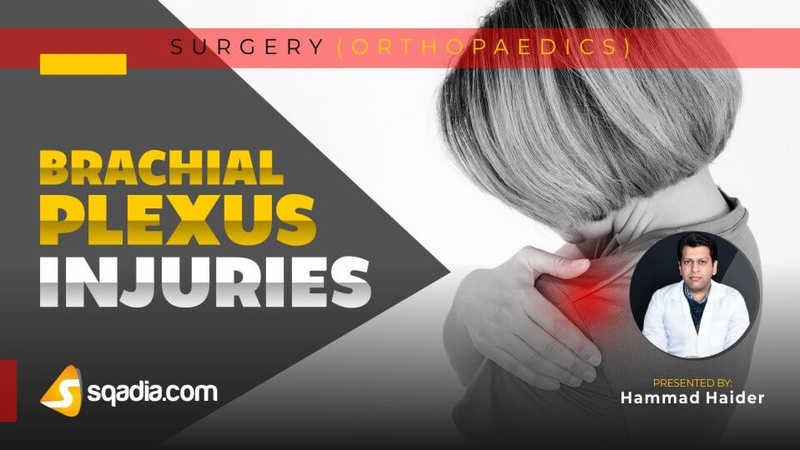 Types of brachial plexus injuries accompanies supraclavicular lesions, infraclavicular lesions, and fractures of clavicle. Clinical features of brachial plexus injuries are often high-energy injuries, rupture of the subclavian or axillary artery, and neurological dysfunction. The level of the lesion in upper plexus injuries is that the shoulder abductors, external rotators, forearm supinators are paralysed. Preganglionic lesions are irreparable while postganglionic lesions may either recover or may be amenable to repair. Brachial plexus injuries can be managed through surgery, grafting, limited reimplantation, monitoring neurological features. Surgical exploration reveals there are three typical patterns of injury i.e. C5,6(7) avulsion or rupture with C (7)8, T1 intact, C5,6(7) rupture with avulsion of C7,8,T1, and C5–T1 avulsion. Nerve grafting is often necessary and the results for restoration of shoulder and elbow function are quite good. Nerve transfer is an alternative way of providing functioning axons. The best results of plexus reconstruction are obtained after very early operation. Obstetrical palsy is caused by excessive traction on the brachial plexus during childbirth, for example by pulling the baby’s head away from the shoulder or by exerting traction with the baby’s arm in abduction. Erb’s palsy is caused by injury of C5, C6 and (sometimes) C7. Klumpke’s palsy is due to injury of C8 and T1. In total plexus injury the baby’s arm is ﬂail and pale and all ﬁnger muscles are paralysed. In Narakas group 1 injuries of C5, C6 the abductors and external rotators of the shoulder and the supinators are paralysed. In Narakas Group 2 the wrist and digital extensors are also paralysed. In Group 3 injuries there is ﬂaccid paralysis. In Group 4 injuries ﬂaccid paralysis is accompanied by a Horner’s sign. Brachial neuritis is an inﬂammatory condition of unknown aetiology that affects the upper portion of the brachial plexus. Electromyography is done for diagnosis of brachial neuritis. Clinical features of long thoracic nerve are paralysis of serratus anterior, aching and weakness, unopposed pull of trapezius and rhomboids. Spinal accessory nerve supplies the sternomastoid muscle and then runs obliquely across the posterior triangle of the neck to innervate the upper half of the trapezius. For the better understanding of MBBS students, highly professional surgeon aims to give information on clinical features. Clinical features of spinal accessory nerve involve poorly localizing pain, winging of scapula, reduced trapezius mass. Suprascapular nerve arises from upper trunk of brachial plexus. Axillary nerve arises from posterior cord of brachial plexus. This section of medical lecture brachial plexus injuries covers the medical aspect of forelimb nerve injuries. In radial nerve, low lesions are usually due to fractures or dislocations at the elbow. High lesions occur with fractures of the humerus or after prolonged tourniquet pressure. Very high lesions may be caused by trauma or operations around the shoulder. Treatment of lesions of radial nerve can be carried out through grafting, neurapraxia, lively hand splints, internal ﬁxation. Low lesions of ulnar nerve are often caused by cuts on shattered glass. High lesions of ulnar nerve occur with elbow fractures or dislocations. Treatment of ulnar nerve lesion is the suturing of divided nerve. The median nerve is most commonly injured near the wrist or high up in the forearm. For treatment of median nerve lesions, suture or nerve grafting should always be attempted. Postoperatively the wrist is splinted in ﬂexion to avoid tension.